One of the most beautiful and rugged parts of Peru is nestled in the Andean Highlands of the Huaraz region, northeast of Lima. It's part of the Huascarán National Park that is a UNESCO Biosphere Reserve and World Heritage Trust site. This area is the climbing and hiking centre of Peru and the spectacular Callejón de Huaylas Valley is a magnet for thousands of travellers looking for beautiful mountain scenery, superb hiking opportunities, glacial lakes, and quaint mountain villages and markets. Wedged between the dramatic snow-capped mountains of the Cordillera Blanca and the dry, dark Cordillera Negra range, the wide valley is split by the powerful Santa River. It is fringed by a group of picturesque little villages and towns that serve as starting points for hiking expeditions into the Andes. Situated among them is the town of Huaraz, a tourist hub and the primary base for exploring the area, which is surrounded by peaks of over 16,500 feet (5,000m). 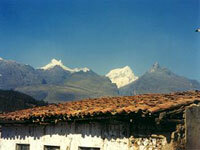 Towering above them all is Peru's highest mountain, Huascarán. The valley gave rise to the ancient Chavín civilisation and the spectacular 1,500-year-old ruins of the Chavín de Huántar temple can be visited just hours away from Huaraz, stunningly set among the majestic peaks of the Cordillera Blanca. The remains of the ancient, UNESCO-listed adobe city of Chan Chan is also in the region. Huaraz also offers hot springs at Monterrey, immense glacial lakes like Lago Parón, and spectacular lookout points from the narrow and twisting roads leading into the valley.